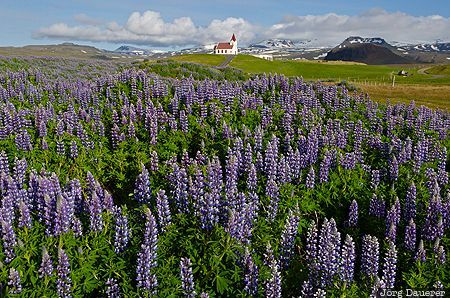 The church of Ingjaldshóll (Ingjaldshólskirkja) behind a sea of blue flowering lupines (Lupinus Nootkatensis) with the snow covered mountains of the Snæfellsnes Peninsula in the background. Ingjaldshóll is in Vesturland in the west of Iceland. This photo was taken in the evening of a cloudy day in June of 2012. This photo is in the Photo Calendar "Iceland". This photo was taken with a digital camera.